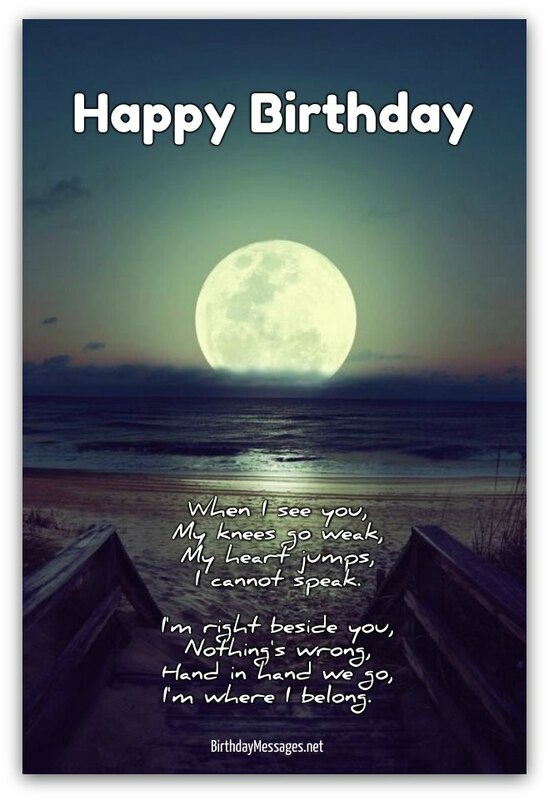 The very best romantic birthday poems can be the spark that ignites true passion on your sweetheart's birthday — just like the beautifully written, romantic poems for birthdays here. Choosing a poem as a birthday message is a wonderful romantic gesture. Poetry at its finest is an incredibly romantic way to make your loved one's birthday celebration an unforgettable experience. See for yourself right below. Romantic poems have the power to truly ignite your sweetheart's passion any day of the year — imagine what they can do on his or her birthday. Fireworks, for sure. Of course, romantic poems for birthdays come in many shapes and sizes, so choosing the right one for your beloved is not exactly a walk in the park. But it's not rocket science either. Romantic birthday poems can be short, long or somewhere in-between. Some people can only tolerate short poems. For others, the longer the poem, the better. Choose one that matches your loved one's attention span for poetry. 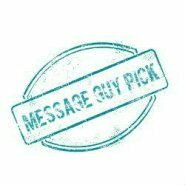 Decide if your beloved likes clichés in poems, like the ones you find in pop songs, more esoteric verses or real, cutting-edge poetry. Some romantic birthday poems are more, for lack of a better word, poetic (lyrical) than others when it comes to conveying feelings. This is not necessarily a bad thing — it just means you need to determine how poetic you want your honey's poem to be and choose one accordingly. Pick a poem that sincerely expresses the love you really have for your sweetheart. The more sincere you are with your feelings, the more he or she will like the poem. You don't to select a poem with the typical romantic scenarios, like the day you met. Go bigger. The poem you choose can be about anything, as long as its romantic and expresses your feelings honestly. Most important tip: Choose a poem that's personal — personal for you and personal for him or her. The poem you select should accurately reflect the love you have for each other. Don't be afraid to be authentic with your feelings. Emotion is what turns prose into poetry, so don't skim on this aspect of choosing a poem. If the poem you choose hides your true feelings, your significant other will pick up on this insincerity in an instant. 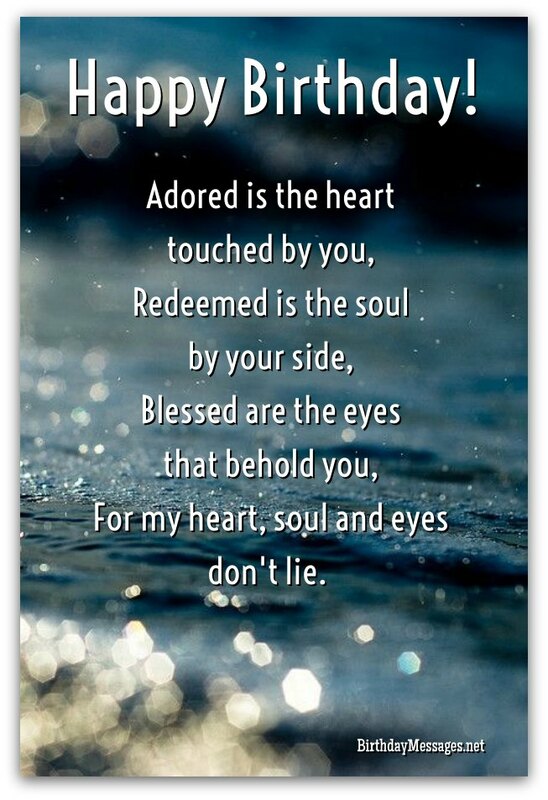 Read the poem you like aloud to yourself to see if they stir up any feelings in you. If they do, they will probably do the same for your sweetie. Contemplate what you want your birthday poem to achieve. Do you want to express your love? Do you want to apologize after a bad argument? Would you like to set the mood for the rest of the night? Do you want to get back with someone? Needless to say, choose a poem that achieves the objective you have in mind. Pay close attention to the end of the poem you select. Because the most powerful message (emotionally) of any poem usually comes on the last line, like a punch line for a joke, you want your choice to have the right message for you, your lover and the relationship you have with him or her. Than my love for you. My sweet treat I cannot refuse. My love for you burns so. Happy birthday, my dearest dear. Check out the romantic birthday poems below! My nighttime heat all these years. Forever I have loved you. With my heart laid bare. Let me show you on your special day. Want to see what the world's best poets have done? Check out the Top 10 romantic poems of all time! You don't have to stick to one poem. 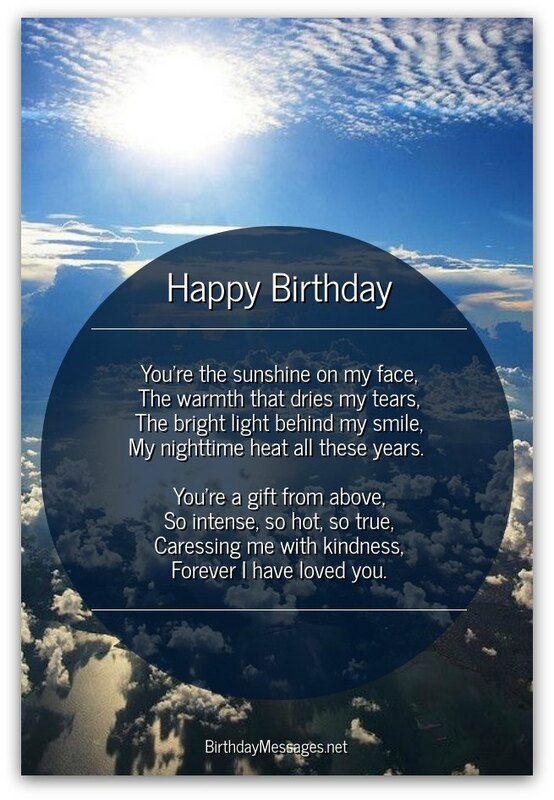 Put as many romantic birthday poems as you want in the eCard or greeting card for your sweetheart. If you want to choose from the world's 10 best love poems, click here to see the "Top 10" of all time.